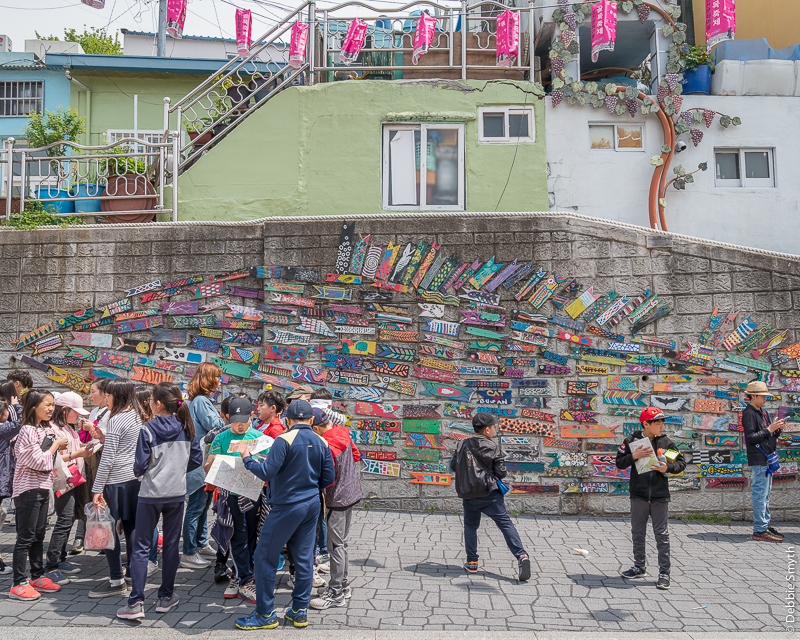 For our walk today, I’m taking you to Gamcheon Culture Village, a small town on the edge of Busan, South Korea’s second largest city. Put on your comfortable shoes, as it’s hilly terrain, and we’re off to enjoy some wonderful views in a fascinating location. 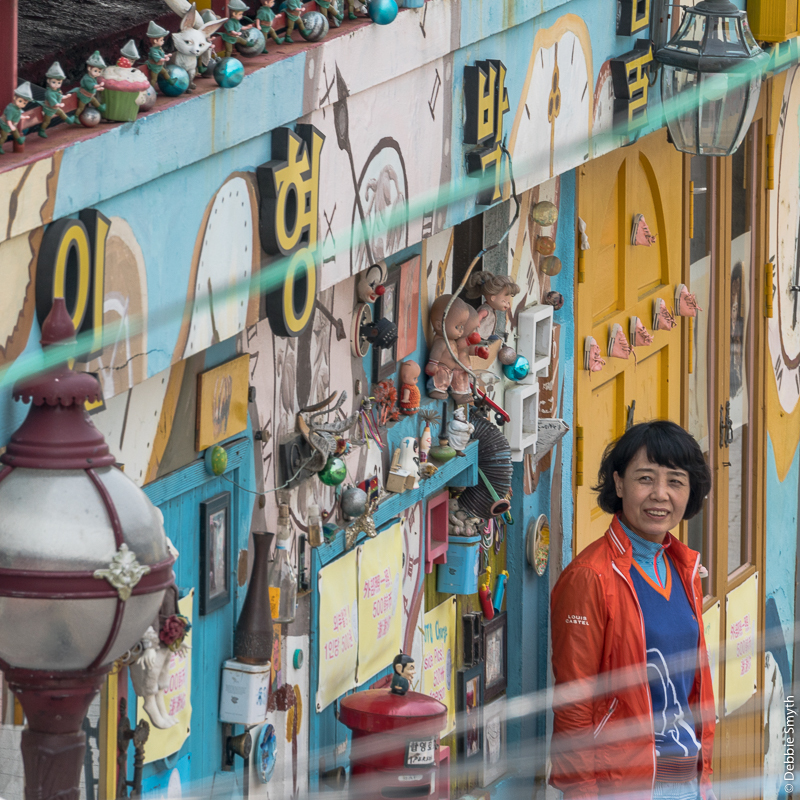 As a result of the spreading occupation by the north, Busan served as temporary capital of the Republic of Korea for a while, and also became home to many people fleeing the war. The population soared, with around half a million refugees there by early 1951. 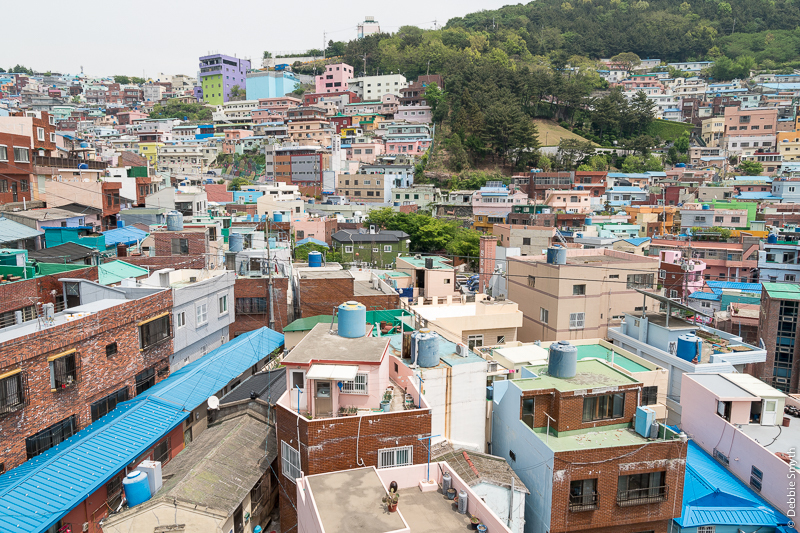 With overcrowding in the city, shanty towns grew up in surrounding areas, one of which is now known as Gamcheon Culture Village. 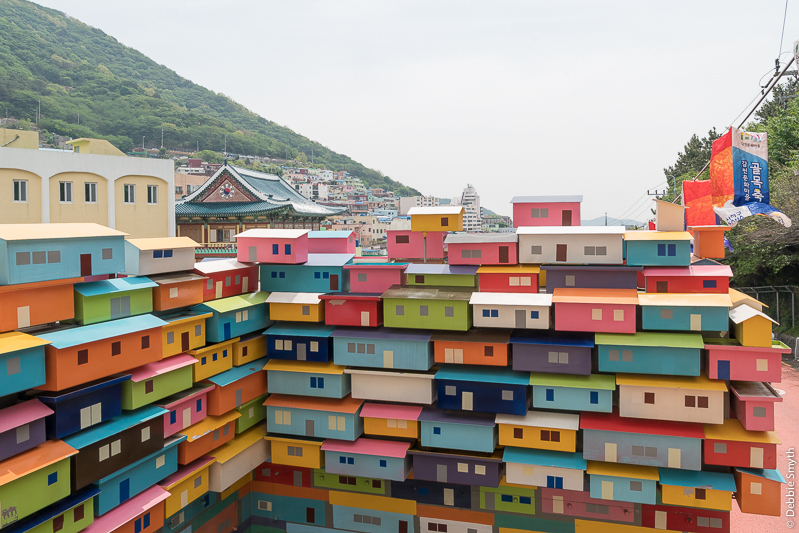 Before the war, Gamcheon had been just a tiny collection of houses perched on a steep hill, but it now grew rapidly with the addition of small houses and shelters made of any materials that came to hand. 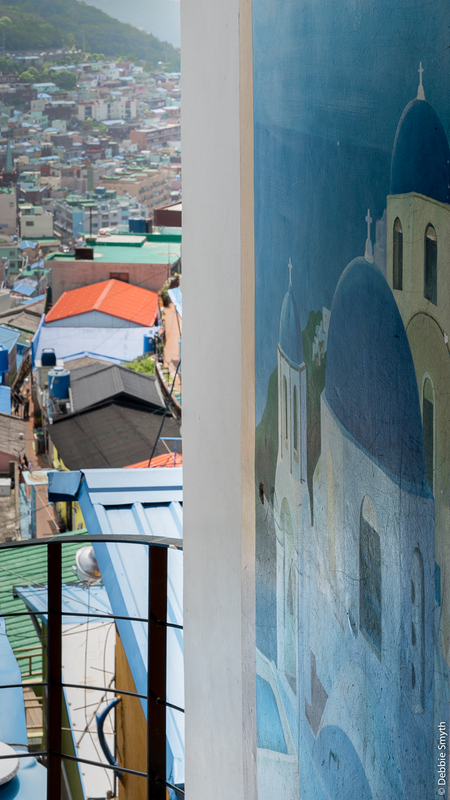 Conditions here were dreadful, but improved somewhat in the following years, mainly due to the arrival in 1955 of Cho Cholje, leader of the Taegukdo religion. 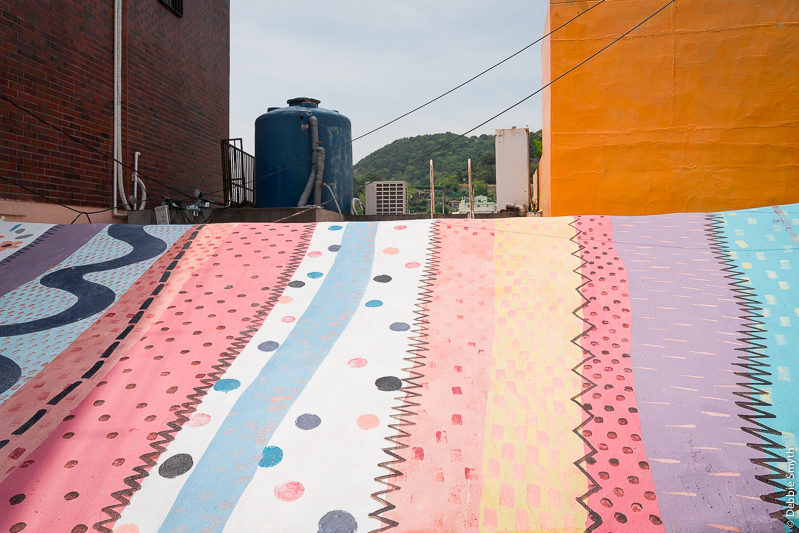 However, the place was still poor and in 2009, the Ministry of Culture, Sports, and Tourism stepped in with the Dreaming of Busan Machu Picchu project, with the aim of turning the place into a creative community run by residents, artists and the local administrative office. The result is a village that is now firmly on the tourist trail. 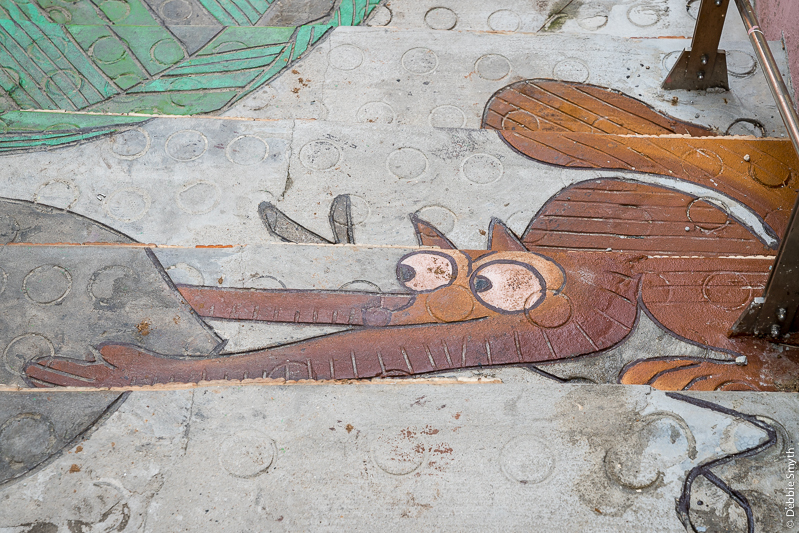 As you enter the village, you will find a large map and information sign, plus some small shops and a few murals that set the scene. 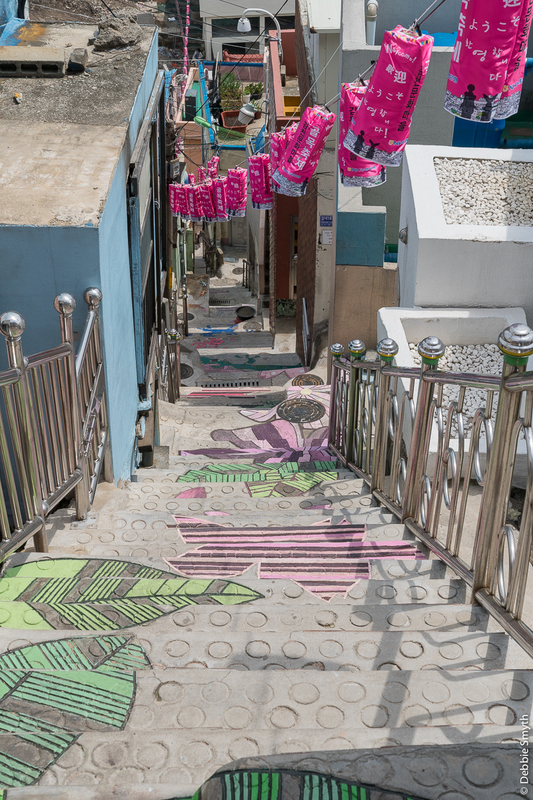 You can pick up a map to help you navigate, but the main guidance I can give is work your way up, get lost for a while, explore plenty of alleys and stairways, then work your way back down. 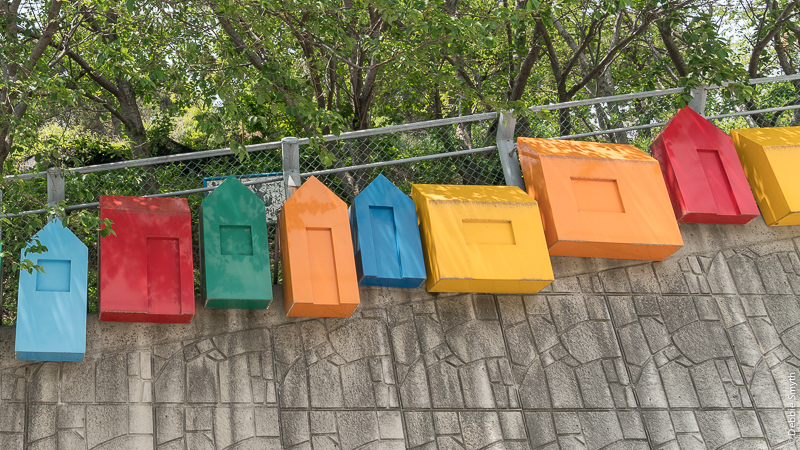 There are many places offering food and drink if in need, so relax and enjoy this colourful place. 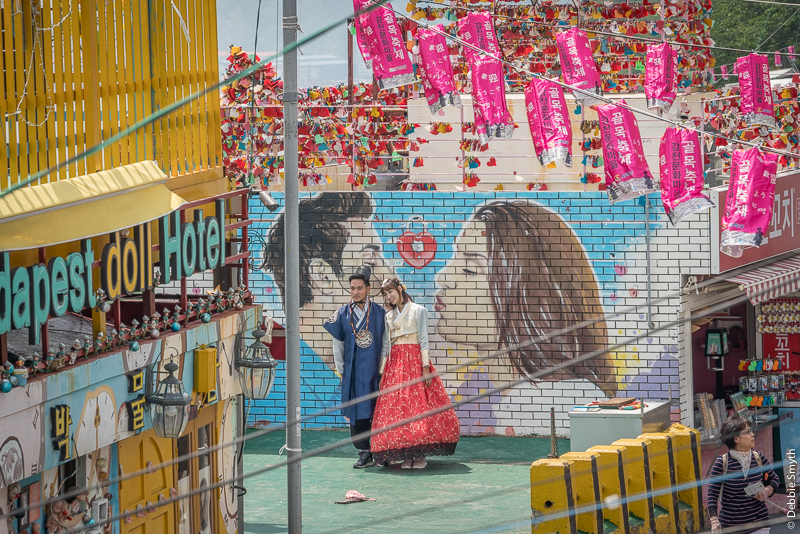 One of the early highlights is the Grand Budapest Doll Hotel, a building with wacky exterior decoration and a courtyard next door featuring a huge mural that has become a popular photo spot, especially for romantic couples and those dressed in traditional Korean costume, or hanbok. 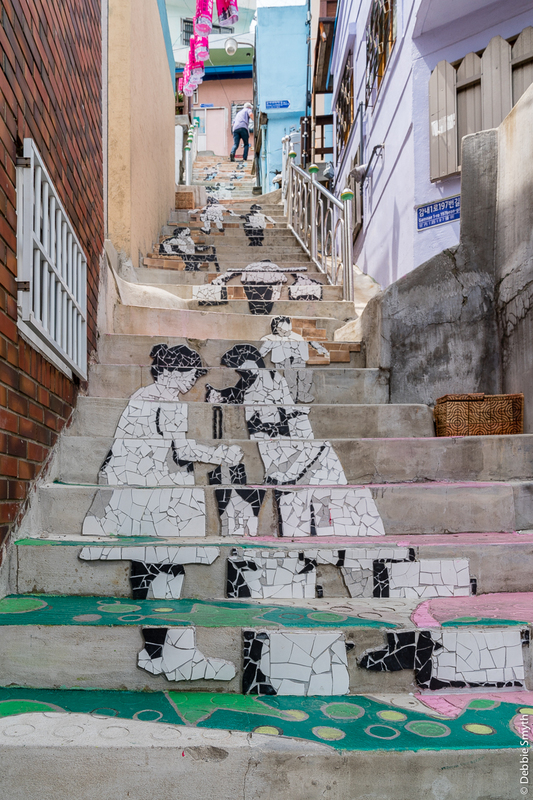 One of my favourite discoveries in Gamcheon featured some “flooral” art, and was also an exhausting find: the 148 steps of the Stairs To See Stars. This name was given for a reason, as the locals trudging up and down here with their heavy loads really did see stars, and not just the ones in the sky. 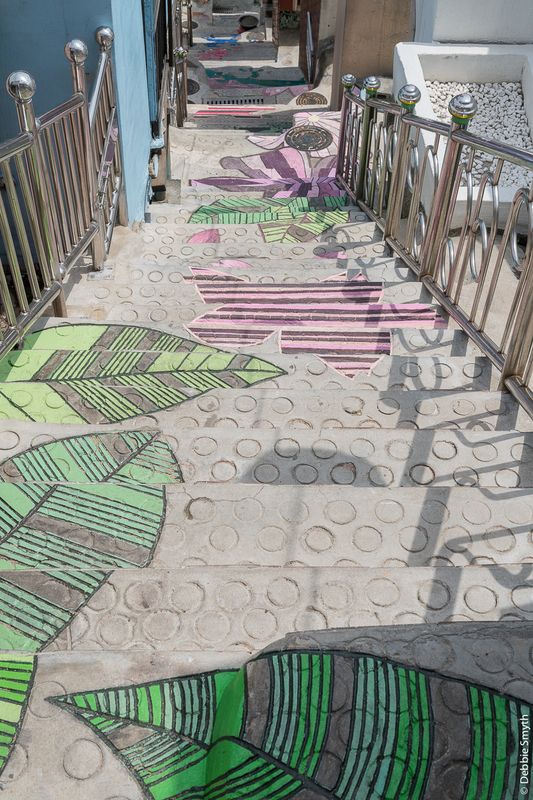 Fortunately, Gamcheon’s artistic renovation means that there are now good excuses to stop and relax on the way up these stairs. 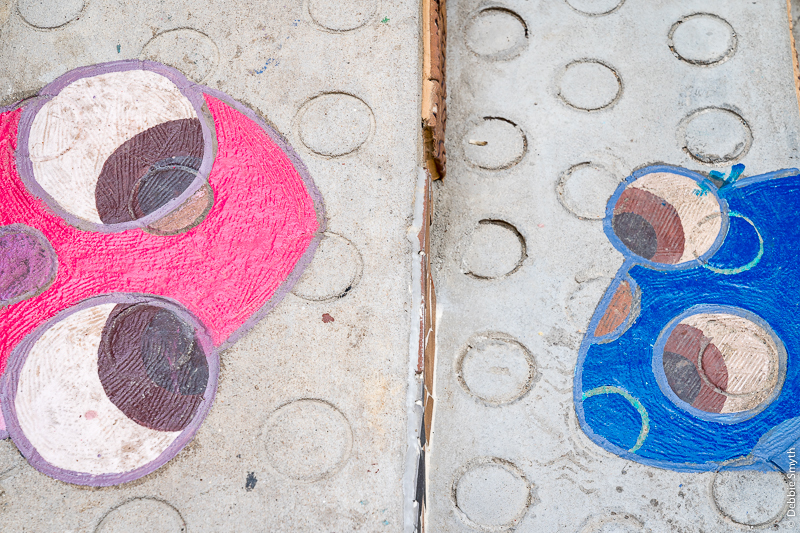 As you have seen, this village is now overflowing with colour and texture. Plus steep slopes. 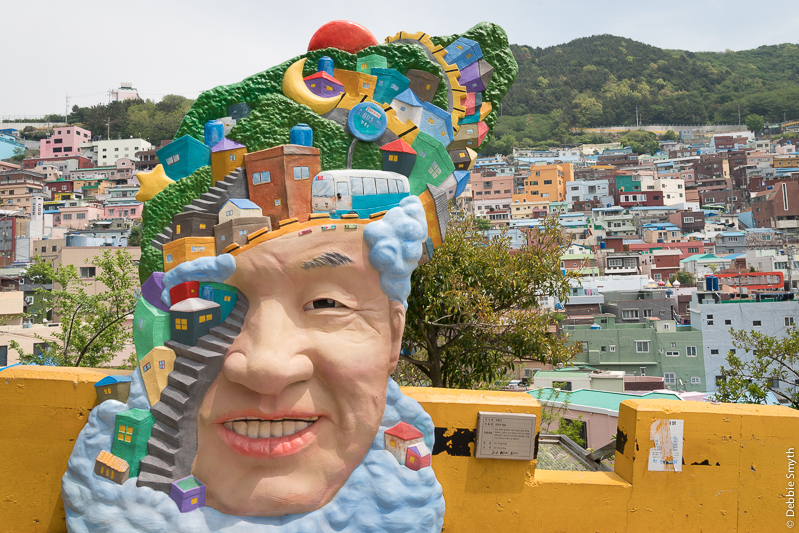 It carries a number of nicknames, including Machu Picchu from its overhaul project’s mission statement, and also Korean Legoland and Korea’s Santorini. I’ll now leave you with a few more glimpses of this place, and let you mull over the suitability of those names. 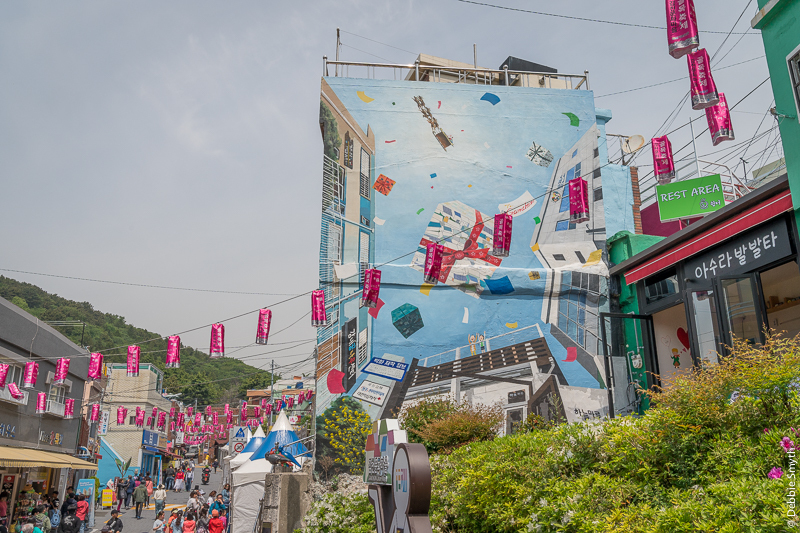 If you have the chance to get to Busan, Gamcheon is easy to reach from there. 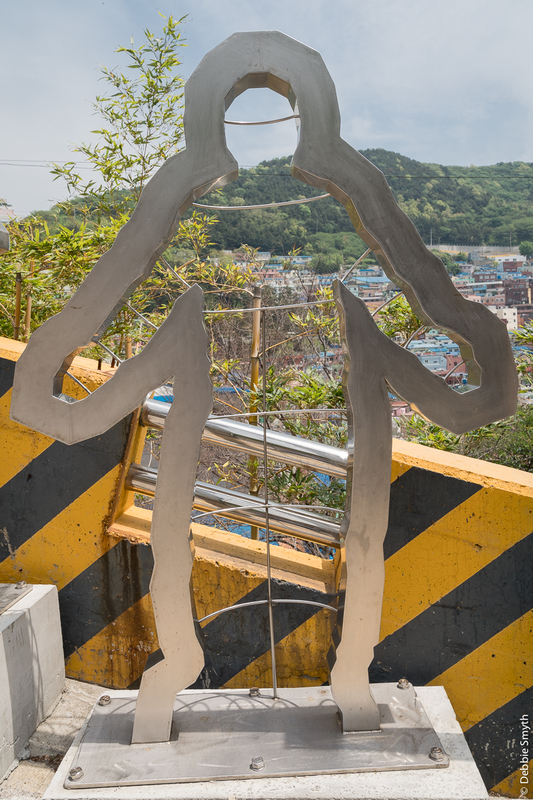 Simply take the subway to Toseong Station (line 1), take exit six, walk straight ahead and turn right. You’ll spot a bus stop in front of the hospital, from where you can take minibus 2 or 2-2 to the village. If you want to speed things up, you can also take a taxi. What an interesting place. Thanks for all the tips. 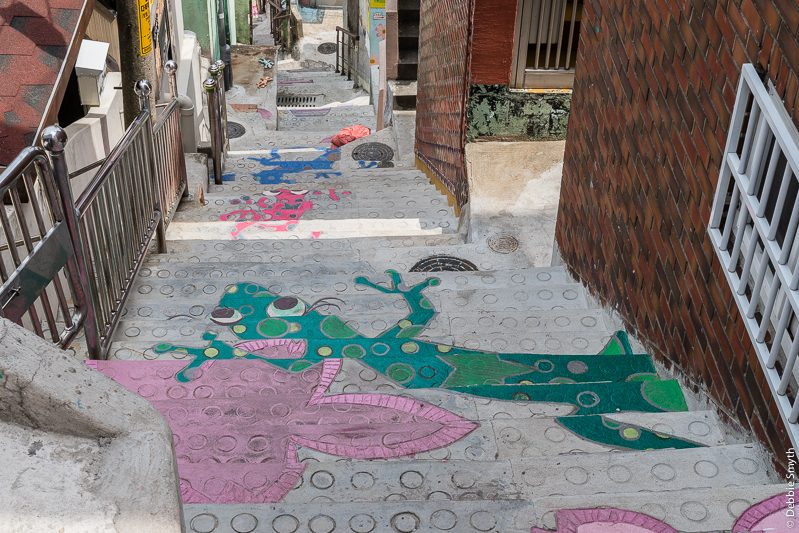 I might be visiting Busan next May! A brilliant souvenir post for us. 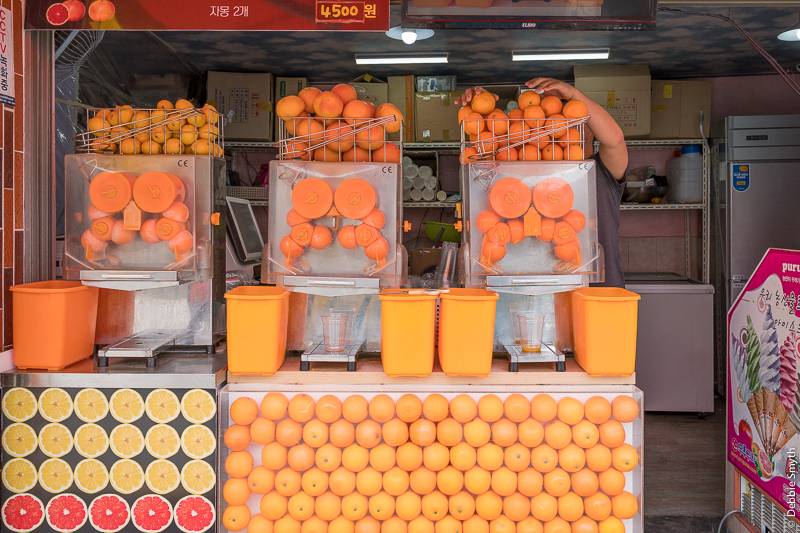 We visited South Korea two years ago because our daughter was working in Busan, a city we loved. 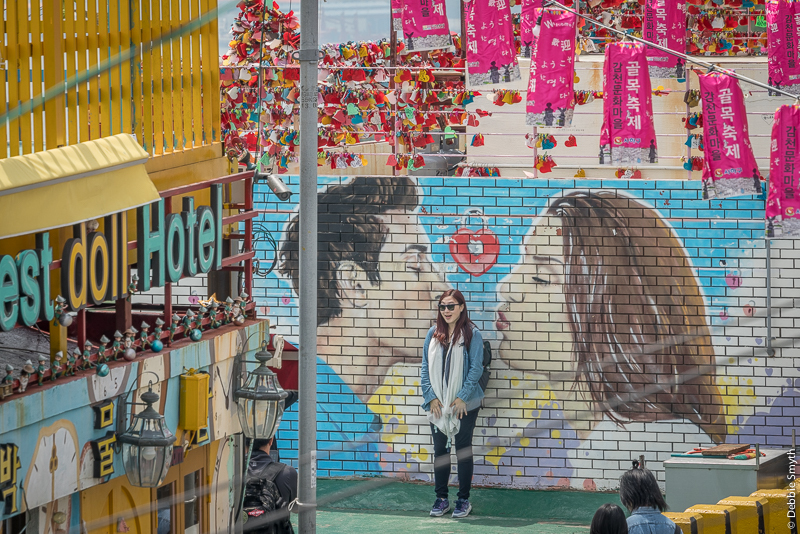 I didn’t realise Gamcheon was likened to Machu Puccu! If I ever go there, I’ll be ure o visit! All beautiful photographs … thanks for taking me along on your trip. Excellent geography and history lesson, Debs! Fabulous post, Debs! Thanks so much for the link. 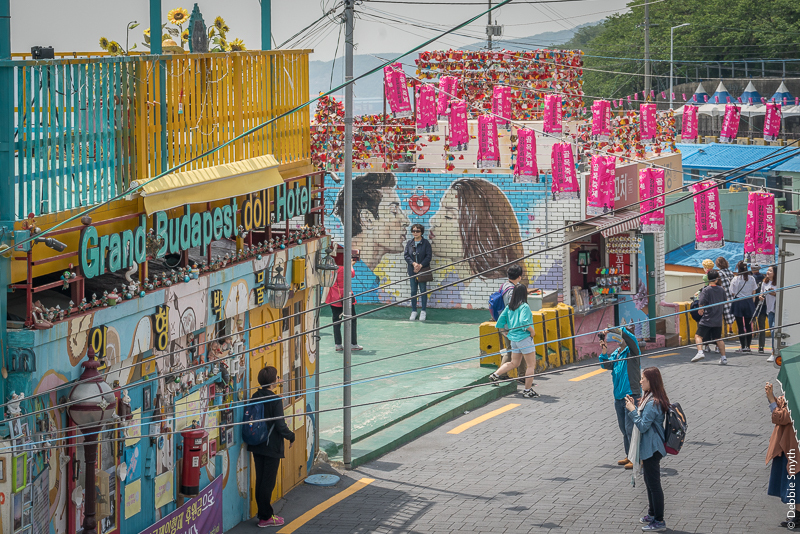 What a weird and wonderful place 🙂 🙂 I recently read a novel with a background of the Korean war and those were rough times, whichever side you were on. Indeed. And it still continues for many, in a situation that tore families apart and forced many to emigrate.